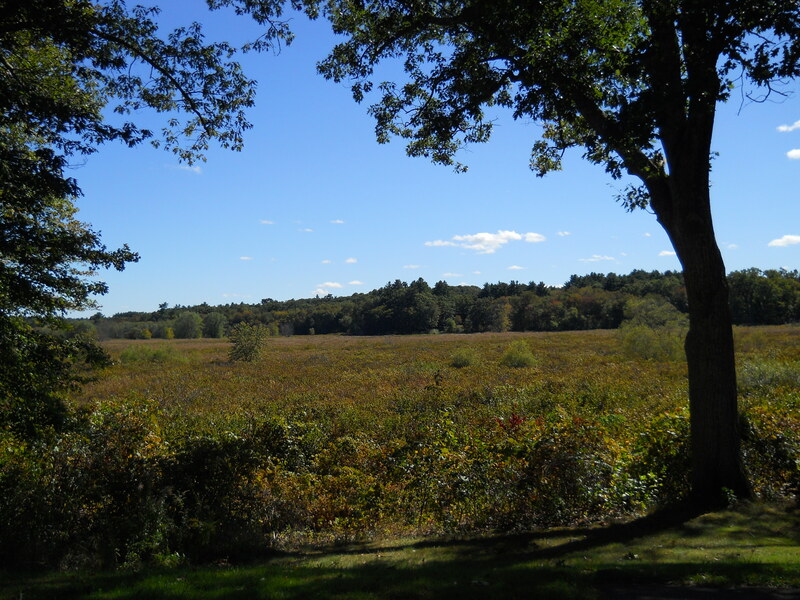 Round Hill and Weir Hill (Great Meadows National Wildlife Refuge) - Sudbury, MA - Take a day trip! Round Hill is a property of the Sudbury Valley Trustees that connects to a trail around Weir Hill, which is part of Great Meadows National Wildlife Refuge. Though they are owned and managed by two different organizations, they border each other and should be considered part of the same place for recreation purposes. There is also Sudbury town conservation land as well but most of the multi-use trails are on the Round Hill and Weir Hill properties. These properties are part of a complex of parks and other protected property that preserves the wetland environment of the Sudbury, Assabet and Concord Rivers and the all the biodiversity contained in it. It feels surprisingly serene and separated from the business of the Greater Boston area and is a great place to spend a few hours. 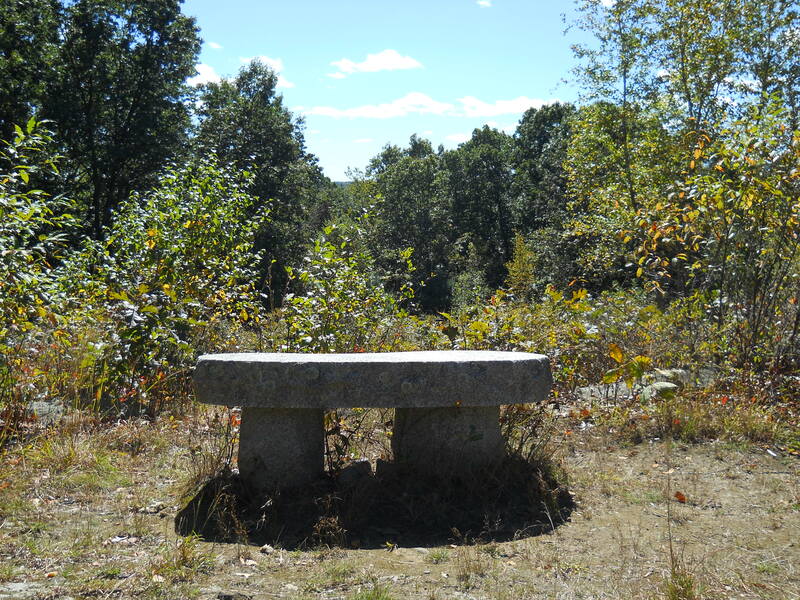 Bench at the top of Round Hill in Sudbury, MA. Hiking Trail atop Round Hill in Sudbury, MA. 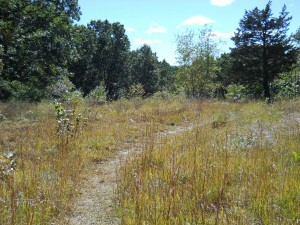 loops possible and a trail over the top of Round Hill and the meadow at its summit. Weir Hill also has a nice mile long loop trail with lots of interesting signs and placards to read about the area. For a decent trail map of both Weir Hill and Round Hill please go the Sudbury Valley Trustees website for Round Hill Reservation. For a more detailed map of the interpretive Weir Hill loop trail in Great Meadows National Wildlife Refuge stop by the visitor center parking lot and grab one of the trails maps that is in the display. Cross Country Skiing & Snowshoeing: Most of the hiking trail network makes for great cross country skiing and snowshoeing if there is enough snow. There is one stretch on the Weir Hill Loop trail that might be tough on cross country skis as there are a lot of switchbacks going down the hill. Canoeing and Kayaking: There is a boat launch on the Sudbury River off the Weir Hill loop trail in the Great Meadows National Wildlife Refuge. It is a short walk from the main parking lot at the visitor center. Dog Friendly: The Round Hill portion of this area allows dogs, however they aren’t allowed in the Weir Hill area that is part of Great Meadows National Wildlife Refuge. Picnicking: There is a picnic area near the Great Meadows refuge headquarters parking lot. Gardening: There is a community garden space in the Town of Sudbury’s conservation land section of this area. I am not sure if you need to be a town resident to get a plot at the garden, here is a link to the Sudbury Conservation Office who manages this place and should be able to answer any questions you might have. Hunting: Limited archery hunting is permitted by special lottery in Great Meadows National Wildlife Refuge. For more information contact their visitor center or visit their website. Fishing: Fishing from riverbanks and boats is permitted in Great Meadows NWR as long as you have a Massachusetts fishing license and obey state rules.